Recently my friend Debbie wrote me on Twitter and told me she loved the handmade (cold process) soap I had given her for Christmas and wanted to learn how to make her own. She asked, “How do I start?” Since that’s probably a longer answer than 140 characters on Twitter will give me, Debbie, this blog post is for you! 1. Read this article on the types of soapmaking. The type of soap you want to make is ‘Cold Process Soapmaking. 2. 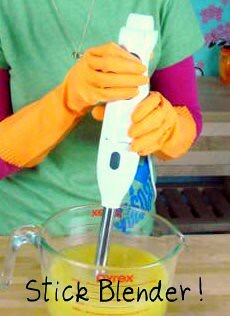 Watch the 4 *free* videos at SoapQueen.TV on Cold Process Soapmaking. After learning more about the process, are you still interested in moving ahead? If not, soapmaking is super fun! Consider a slightly less labor intense method of soapmaking – Melt and Pour soap or Rebatching soap. Kits for Melt and Pour and Rebatching are here. 3. Keep educating yourself. 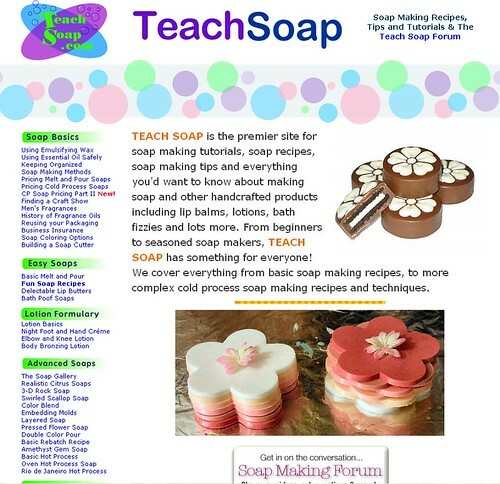 TeachSoap.com is a great resource. The TeachSoap forum is helpful. All of the posts here tagged with “Cold Process” add to your knowledge base and the SoapDishForum is a fantastic learning opprtounity. 4. Order a beginner kit. It has everything you need to make your first batch of soap except the Lye. Order the lye along with the beginner kit. Beginner kit A is here. Beginner Kit B is here; Lye is here. 6. Get yourself to Goodwill to get a stainless steel bowl or glass bowl, a couple spatulas, spoons and invest $20 in a good Stick Blender. 7. Wait for your kit. Keep reading. Let your excitement build. 8. When the kit arrives, safety up! Goggles on! Gloves on! Cover those counters with newspaper. Lock pets outside. Children under 14 should be away from your soaping area. Find one hour of uninterupted time. Now, get ready? Set? Soap! Next Post: Hearts, Flowers and…Gnomes? Hi all, let me first say what a wonderful help this site has been. Now for my silly question, what do I line my molds with? We like to line our molds with freezer paper, shiny side up. Ok, great! Thanks for these tips! I JUST got that book for the library! I have watched all your videos on youtube about cold process soap making. I am so excited to make some soap!!! Thanks so much! 2. Goggles and Gloves are a must. 3. Cover you counter to protect against spills. Make sure your parents are around to help if things get out of hand. 6. Make sure you research your ingredients to ensure that they’re all soap safe (no candle, no potpourri). 7. My favorite book is the Susan Miller Cavitch Book, The Everything Soapmaker. I’d highly recommend it. Hi – I’m new to soaping and have been trying my hand at cp. My problem (I think) is white speckles in most of the soap, but also some bigger white spots are present in some batches as well. I am afraid that these may be lye pockets and am sick at the thought of having to dicard so many batches, (they are currently all curing, all are firm and otherwise beautiful). I took a cp workshop and was told that you could actually leave the pot and keep coming back to stir it while waiting for trace. I plan on using a stick blender next time to see if this helps (it took a few hours on rainy days to reach trace). I appreciate any advice you could offer – I have not been able to locate any pics of lye pockets and am not sure about the “zap” with the tongue technique – tastes nasty..but is it “zap” ??? If so…does it have to go in the garbage??? Many thanks! Hi Anne-Marie! I am 15 and very interested in cold process soap. I am ready to get started!!! I am going to head over to the goodwill and get some metal/glass bowls, whisks, spoons, and spatulas. As well as some old towels. Is there a any beginners advice/warnings in a blog post? Thanks!!! Found it: http://www.flickr.com/photos/9… Totally exploring now. Thank you! Sorry..lost some of my prevous post..to see the photo stream type in under google cupcake nana’s soap…..
AM…you must check out this photo stream of soaps that I came across by typing in google hey are amazing,especially the wrapped ones that are sealed with wax and paper….also love the soap sitting in its own hammock! Great intro to soapmaking! You can do it, Debbie! DOn’t forget to line your molds! before you begin! Oh that stinks when you realize you forgot to do THAT!! !